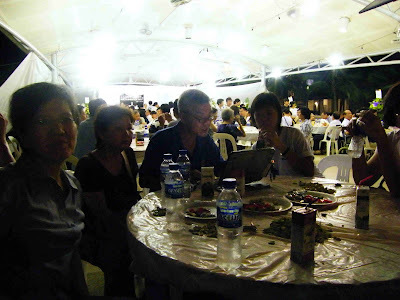 Attended the wake of one of our Bucky Group members, Mr Sng Tong Hai. Departed peacefully on the morning of 26 April 2009 at the age of 66. We sang the song "What One Man Can Do" to Tong Hai. I didn't video the singing, but here's a clip I got from Youtube. This song was composed by the late John Denver, as a tribute to Buckminster Fuller. Towards the end of the evening, Tong Hai's daugther and movie producer, Tania Sng, asked if she can interview me as part of a film she intends to put together about the last part of her father's journey. 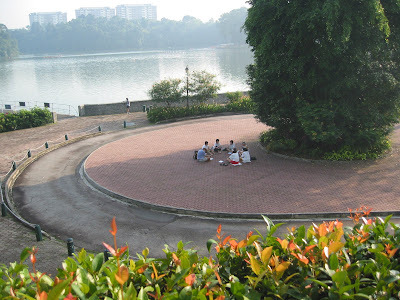 I know Tong Hai first in the Theosophical Society's Singapore Lodge and later at the Bucky Group. I remember I met him once in a bus and he told me he liked to continue learning and upgrading his knowledge, as he would not like to be seen as being "over-the-hill". And that he did, joining continuous learning group like the Bucky Group and many others. The other time I remember is when I met him by chance at a theatre lobby and he told me about his movie "Cages", produced by his daughter Tania. 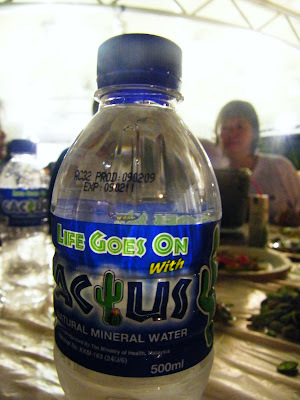 Then, as I was taking a sip of water, I realised the bottle says... "Life Goes On".